My beloved friends, here we talk about do good. There are six things that should to bear in our heart and mind in doing good. This verse affirmed that for the Christians do good is not just a moral instigation and not just something mandatory to be done, also not as a way to get salvation or so we can live in Our Father’s home in heave but rather as a Christian identity. Do good is a faith expression and a proof that we fulfill the God’s law, reflect the God’s love, we were created to do good in accordance to that has outlined by God. We don’t have to wait the right time and the right place to do good. While there is opportunity to do good, let’s do it. We shouldn’t be like a young woman in the story above who put off the opportunity to do good and finally she got deep regret. We should not miss the opportunity that has been given by God to do good. The opportunity to do good is an opportunity to please and glorify Him, to change our lives and the lives of those who got our help. To do good is a great commission from God. To whom we should do good? First we have do good start from our household of faith then to all those who in need and deserve. What the purpose we do good? We have to realize that do good to others is not for a personal interest such as want to be appreciated, or be respected and without expecting to get anything back. We should to do good with full of merciful. Where we should do good? Anywhere as long we have opportunity to do good, whether in the office, church, in our family, or in neighborhood around us. Anywhere! Just because everything we do is only for God. How we do good? There are so many ways to do good. We could start with these things such as: give big attention, affection, and patience hear someone sharing their problems. Encourage and pray to those who have affliction and suffering. We also could give support in the form of funds to those in need, if we be able. My beloved friends, have we done something good for other in our lives? Have we utilized opportunity that has been given by God to do good? 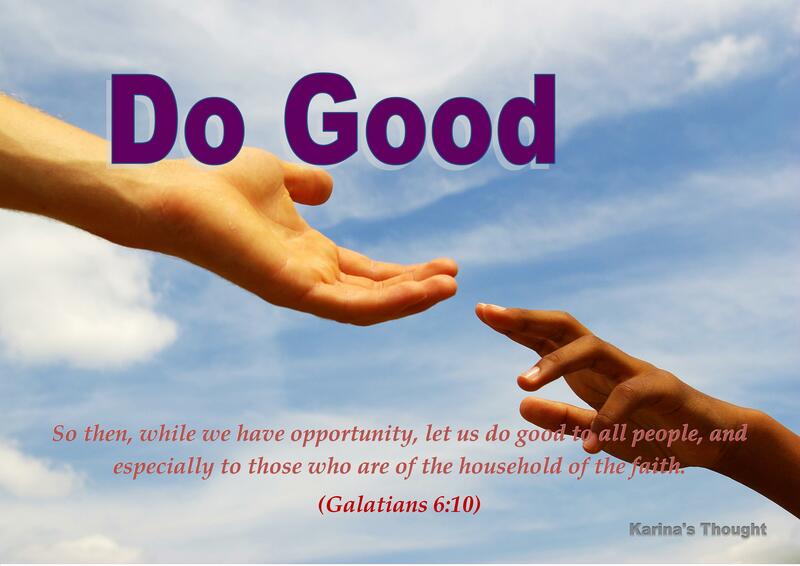 This evening allow me to encourage all of us to make “Do good” as our lifestyle. Don’t be weary in doing good anywhere, anytime, and to anyone who needs our helping hand for the time comes we will reap the harvest of what we have done. Don’t eliminate our identity as the followers of Christ. Don’t put off the opportunity to do good because it may not happen again. Let’s use the opportunity that has been given by God to glorify His name, radiate His great love to the world through to do good to others. Amen. Well, in this post I want to continue the Elijah’s story. Let’s look further what happened after he came to broom bush and prayed. Let’s have a look what the God’s answer of his prayer. 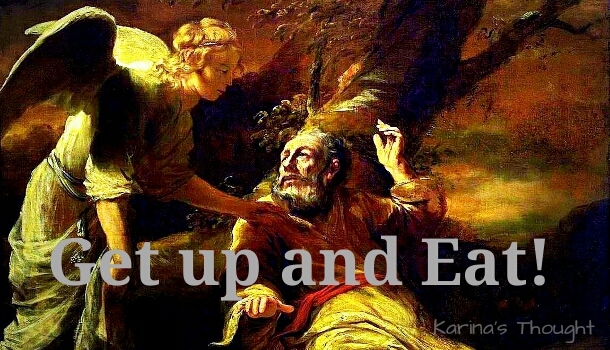 After Elijah prayed, he lay down under the bush and fell asleep, and then an angel came touched him and said: “Get up and eat.”(1 Kings 19:5 NIV) Here there are two important words. This is God’s answer to Elijah’s prayer. This is what God wants so that Elijah can return to the path as God wants. Life will not always be easy; problems will always be there and there times we have to fall and experience a failure. But it does not mean we should give up. As long as God is still with us, as long as we remain live in the shade of His glory, we have to stay eager to get up and go fight. What The Lord said to Elijah also applies to us. God does not want us to be discouraged or lose hope when faced with pressure or failure. He wants us to always remember that His love and faithfulness upon us will make Himself always be with us forever. Now let’s take a look to the second word. Eat! After Elijah did a great job defeating 450 prophets of Baal, he got extremely tiredness. His psychical and spiritual energy drained away so he didn’t have reserves power to face Jezebel’s threat. Then God asked him to eat! Elijah was eating again, and through the food he was able to walk again. Not simply walk for short distance but he was able to take 40 days and night until he reached Horeb, the mountain of God. It is a very important message. We could eat anything to make us full physically. but if we let our spiritual hungry and thirsty, then we will easily infiltrated by fear, anxiety, easy to depressed, making us easy to give up, even make us forget that God is really cares and is always with us. We are not only need food to alive, to stay strong and to get back on our feet, but we also need food for our soul and spirit. Not only our body could sick, but our spiritual also get sick if doesn’t get good and enough nutrition. Therefore we need to continue to equip ourselves with God’s word, which will be able to strengthen us when we want to rise from failure and facing the life’s problems. God’s word is a nutrition source that will never run out. God’s word is the very best nutrient because it already contained all the needed aspects for our spiritual health and growth. God’s word also guides and directs us when we walk in the dark path and don’t know which way should to go. Now we come to the last thing. This is my personal thought based on the Elijah’s story. After we successful get up again and fill our soul and spirit with the good spiritual food, we need one more important thing. Courage to step up! Elijah will never get to the Horeb if he didn’t dare to move. If he only get up and eat but without move, he will not get anywhere. It is also the same for us. We must have the courage to tread to face all the problems and challenges of life. We must have the courage to step up make a big change in our lives and achieve what we hoped. When God asked Joshua to continue The Moses leadership to brought the Israelites into the Promised Land, God said to Joshua: “…Now then, you and all these people, get ready to cross the Jordan River into the land I am about to give to them—to the Israelites. I will give you every place where you set your foot, as I promised Moses.”(Joshua 1:2-3 NIV) The underlined word means Joshua should to make a step, because if Joshua didn’t move, then he will not stepping on anything. Without stepped up he will not get the God’s promise. We will never successful to overcome our problems unless we are willing to get up to make something better. Don’t be afraid to get up again. We are not alone. There is God who always be with us. The second thing is eat! Let’s constantly fill our soul and spirit with God’s word as the best spiritual nutritious food. Don’t let our spiritual starving and thirst just because it will make our spiritual get sick. By maintaining our personal relationship with God through our prayer, quiet time, reading, pondering God’s word every day, and do it in our daily lives will strengthen and make our spiritual lives healthy. The last thing, don’t ever be afraid and doubt to step up! We have God who always be with us and He always watches over the way where we steps. He will never make us stumble. The Lord himself goes before you and will be with you; he will never leave you nor forsake you. Do not be afraid; do not be discouraged.” (Deuteronomy 31:8 NIV) Amen! Here we see that Elijah was a prophet who had an extraordinary firmness of faith. But, as James said, Elijah was still a human being who has weaknesses and limitations like us. We could see this thing when Elijah was threatened by Jezebel. Logically, if Elijah was successful defeat 450 the Baal’s prophet, Jezebel’s threat wasn’t enough to make him afraid. But the fact was, Jezebel’s threat was quite effective to make Elijah afraid! Elijah was so scared, loss of hope, and depressed. Here we see an anticlimax. After he proved the God’s power which was significantly came down through him, it turns out his soul depressed by Jezebel’s threat. His depression escalated and then He came to a broom bush, sat down under it and prayed that he might die. “I have had enough, Lord,” he said. “Take my life; I am no better than my ancestors.” (1 Kings 19:4 NIV) Jezebel’s threat actually not comparable with the power of hundreds Baal’s prophets. Jezebel’s threat was a small pebble but precisely because of it Elijah stumbled, weakens him, and even wants to die. When I really ponder this story, I got an important lesson. Through Elijah we can learn that when we are able and successfully overcome the big problems, we have to be careful with the small problems and don’t underestimate it. Please remember, devil never stop trying to break our faith with many ways. If the devil didn’t succeed destroying our faith through the big problems, then he will use other ways. Devil will do anything and use anything to tear down our faith, make us despair, give up, and always trying to blow out the light of our hope. Satan can make us so depressed and immediately forget about how Great God’s power and care to us and has been set us free from the big problems in the previous time. Moreover, as a human being who has weaknesses, we have to be careful and realize that devil can use our weaknesses to destroy our faith. In our lives we also often experience occurrence as experienced by Elijah. There are times the pressures repeatedly hit us, turns starting from the easy to hard pressure or even simultaneously hit us and it makes us getting tired and discouraged to keep fighting. Hope becomes faint, success looks getting far, and we begin to thinking to give up because no longer feel there is a hope. We might have problems in family, career, business, financial, or health problem. It all could make us depressed, scare, disappointed, and eventually could make us want to give up. The question is should we give up like Elijah who lifted up the pessimistic prayer? The answer is, No! 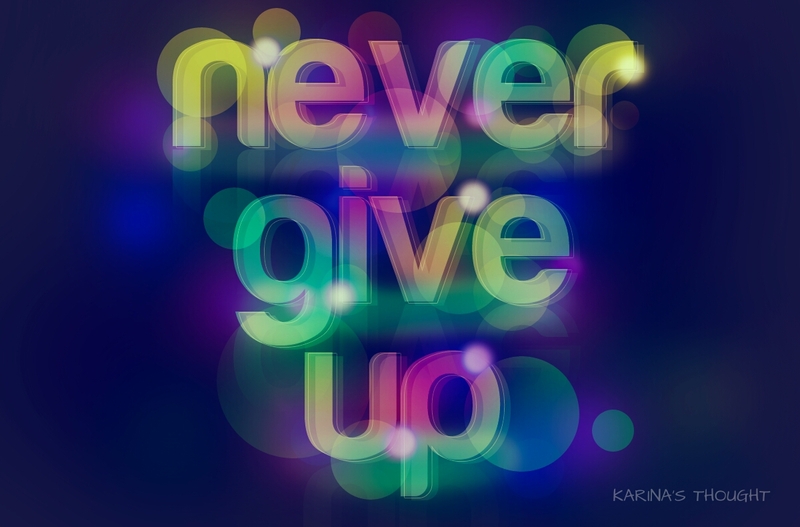 We shouldn’t give up! Because why? Just because, praise to the Lord we have an outstanding Father’s figure who really cares. He doesn’t want us to end up like that. God will never be silent and stand idly to see us wracked by difficulties. Jesus, His only son who has been given to us was a real proof how He is the God who really cares and loves us. If for our eternal salvation God is so concerned, why we have to doubt about His caring to the life problems that hit us? Obviously God wants us always living in hope. It is written in Hebrews: Let us hold unswervingly to the hope we profess, for he who promised is faithful. (Hebrews 10:23 NIV) Yes! God is faithful to His promises. He never breaks His promises. As long as we always have hope in Him, there is no problem that cannot be solved because God is the source of hope for us. Indeed, if we rely on our own limited strength, it will be so difficult. But please don’t forget that we have God who the source of strength. Don’t ever to be afraid and dismayed! Because we have God who has unlimited power and He will strengthen and help us to overcome every problem. Keep stand firm in hope with the power of Holy Spirit and keep the light of our hope still shining. If previously we already feel His help and experience the God’s power and miracles overcoming any of our problems, it means God will remain help us in the future. He never changes now and forever and He is the faithful God. Amen. I always remember the story of Jacob and Rachel. For me their story was a very romantic love story. Jacob felt in love to Rachel and willing work to Laban for seven years to get Rachel. (Genesis 29:18 NIV) There is an interesting thing here. Seven years wasn’t a short time, but for Jacob it seemed like only a few days. Why Jacob could feel like that? Because Jacob really loves Rachel! Love be able to make time goes by so fast! Is the story end? No! Apparently, because there was a custom that the older daughter should get married first, then Jacob should to marry Rachel’s older sister, Leah. What was Jacob’s reaction? He was angry, disappointed, and refused to marry Leah? No! Jacob was willing to marry Leah and He had to work for seven years more. (Genesis 29:26-27 NIV) See? Jacob was able to do something that actually wasn’t wanted to do. He willingly married to someone who he didn’t love in order to could marry Rachel that he loved very much. Why Jacob could did like that? Once again, the answer is because love. Jacob really loves Rachel! Oh how deep and great the value of Jacob’s love to Rachel. An astonishing missions performed by Jesus who down into the world, taking the form of a servant, and was willing to underwent all with obedient, treated with inhumane unto death on the Cross. If we as the father then see our child experiencing all this for a purpose, whatever it is, what do we feel? I am unable to imagine what we feel as the father. But God still chose to allow His only begotten Son just for us so we all do not perish, but have eternal life. He did it all in order to save us from death, moving us to get into the salvation. Isn’t that amazing? Definitely, yes! A question arises, what we have done to God so that God was willing to do all that. If we’ve did amazing and extraordinary things so that God indebted to us? Absolutely no! In fact we did the opposite; we more often hurt and disappointed Him with our deeds that are contrary to His will. In fact we didn’t deserve all that has been done by God. But once again, God still decided to did an amazing thing for us. Not just a little thing, but an extraordinary thing! Why God was willing to do all that? What the power that was able to move God to take this astonishing decision? The one and only answer is: Love! 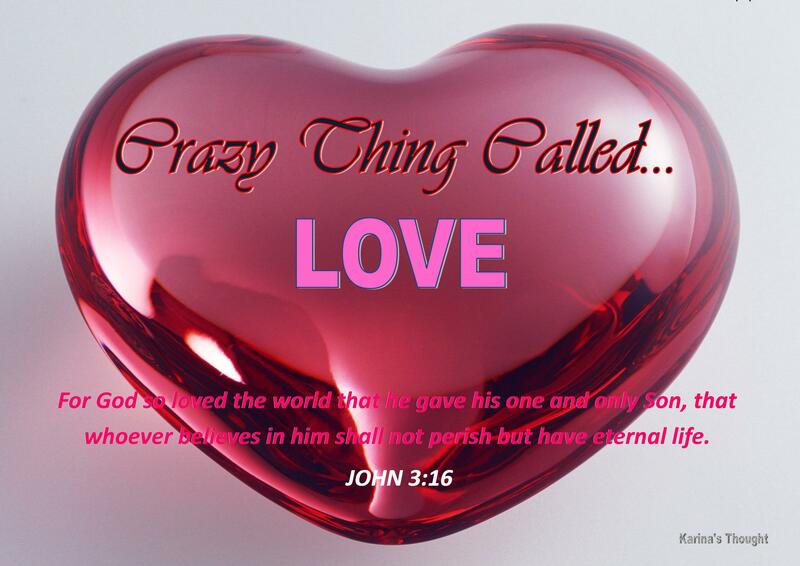 For God so loved…! That’s a power called love, a great thing called love! That’s why I don’t agree if love defined as a little thing. If we read and looking for quintessence of the entire Bible contents, then we will get love as the quintessence. It all comes down to Love. Paul remains us that love is the greatest. My dear friends, today as always I encourage all of us once again think and ponder how great our love’s value to our neighbor and especially to God our Father. Let’s take a moment to ponder everything that has done by God to us. God has poured out his love through the Holy Spirit. Please remember, has been poured out! Not will be poured or hopefully God willing to pour out! This means that there is a seed of love which has been embedded in our hearts. Let us continue to cultivate the seeds of love that has been in our hearts in order to continue to grow well so that every deed in our lives is always based on love. And God has first amazingly loved us by died on the cross while we were still sinners. Furthermore, because He loves us, He adopted us as His child according His pleasure and will. We would not be able to do all that if only rely on our own strength. Therefore, let’s ask for strength to God through prayer, let the Holy Spirit always strengthen us to continue cultivate the seed of love that has been poured out into our heart and eventually people will see that in every of our deed always radiate the God’s true and perfect love. Let people know that through the crazy thing called love we could bring joy, peace, happiness, and goodness into this world. Amen. Special thanks to Deborah Ann for your beautiful poem.